Two teams languishing at the wrong end of the Division Two table meet this week, as Leicestershire and Kent meet at Grace Road with both sides looking for their second County Championship win of the season. Leicestershire’s troubles in the longer format have been well-documented, finally beating their four-day hoodoo with victory over Essex at the start of June, but the Grace Road faithful are still awaiting a first win on home soil since the defeat of Hampshire in August 2012 – 20 games ago. A marked improvement on their last home match will be needed if the Foxes are to break that run, with Tom Curran’s nine wickets for Surrey ripping through a fragile batting unit as the London side gained an emphatic 178-run victory. Former Fox Greg Smith has been brought back on loan from Nottinghamshire for two Championship games in a bid to boost the batting unit, with the O’Brien brothers, Kevin and Niall, required for international duty with Ireland. Whether he will make an impact, however, is another matter. Leicestershire have been kept off the bottom of the table by a Kent side with just one victory of their own this season, coming way back at the end of May when Joe Denly’s second-innings century led the side to an eight-wicket victory over Gloucestershire at Bristol. Promotion aims may have been slightly ambitious for the Canterbury outfit at the season’s outset, but a bitterly disappointing four-day season to date will need to be turned around as soon as possible. The signs are there for an improvement, however. The county far from disgraced themselves against the touring Australians, with Daniel Bell-Drummond starring with an excellent century, and should they gain victory at Grace Road, a late-season push for glory could be on the mind at Canterbury. Bell-Drummond also starred the last time these two played each other, at Canterbury back in May. The opener hit 103 in the second innings as the two contested a thrilling draw – they do happen sometimes – with Mark Cosgrove making a century for Leicestershire. Despite an appalling record with the bat – three runs in 15 innings at an average of 0.25 – Charlie Shreck still provides a huge threat for Leicestershire. The former Kent man took six wickets against his old county when the two sides met in May, with the fast bowler’s five-wicket haul against Essex integral for the Foxes in gaining their sole victory of the season thus far. There was talk a couple of years ago of Daniel Bell-Drummond being capable of knocking on the door of international cricket. Averaging 40 in first-class cricket last year was no mean feat for an opener, and while he has yet to replicate those figures in 2015, a century against a star-studded Australian line-up is a positive indicator for the 21-year old. Bell-Drummond also goes well against the Foxes, averaging just shy of 50. Leicestershire must make do without Kevin and Niall O’Brien, on international duty with Ireland, while Rob Taylor is also away with Scotland. 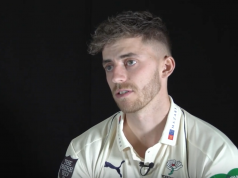 Greg Smith has been drafted on loan from Nottinghamshire. Kent welcome Ben Harmison back to the Championship squad having made a return against the Australians in his first outing of the season. Joe Denly, Calum Haggett, Matt Coles and Darren Stevens are all nursing injuries, but have been deemed fit to make the trip to the Midlands. The glorious British summer is over. Perhaps not, but there is a spot of rain around to dampen the spirits at Grace Road, but hopefully for no more than an hour at a time.